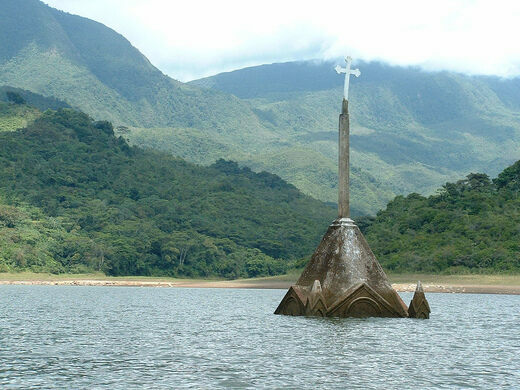 Between 1985 and 2008, fishermen and daytrippers traveling by boat along the lake formed by the Uribante Reservoir in Táchira, Venezuela would be presented with an unusual and eerie sight: a lone and mildewed cross rising crookedly out of the water, clearly attached to a foundation leading to something anchoring it – something big, deep beneath the surface. This "floating island" plateau sits 7,671 feet above the forest floor. Shop with the world's largest number of ice cream flavors, ranging from delightful to downright bizarre. In 2008 however, the cross started to rise higher and higher out of the water, revealing more of the gothic structure below. The unsettling cross was literally just the tip of something much more massive. In reality, the structure was not rising out of the water, but rather the water of the reservoir was receding, revealing what the lake had concealed for more than two decades. 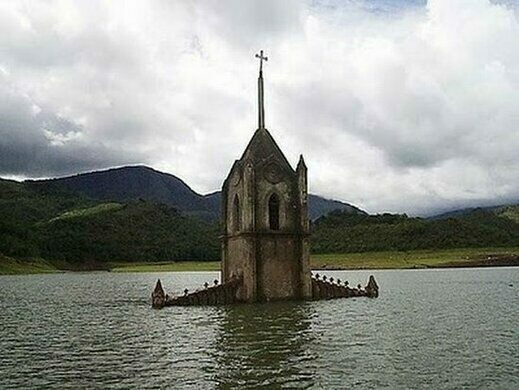 By 2010, the water had receded almost entirely, revealing a large stretch of flat land, and a towering gothic church that was once nearly submerged. The church belonged to the city of Potosi, which in 1985 was purposefully flooded by the damming of a nearby river to create hydroelectric power. All of Potosi’s citizens had to be relocated, their homes and town abandoned, and for 20 years all that remained of their former life was the cross at the top of the church’s steeple, once reaching high into the sky, and then brought down to earth and nearly – but not completely – drowned. It’s not uncommon for a city to be flooded by the building of a dam. St. Thomas, Nevada now rests at the bottom of Lake Mead near Las Vegas. The same happened to Vilarinho das Furnas, a 2,000-year-old city in Portugal. Other times, it’s a natural disaster that dams a nearby river unexpectedly, as it did with the Thistle ghost town in Utah; or the ocean rises and simply never recedes, which caused sunken pirate city of Port Royal, Jamaica. Less common is the phenomenon of a building, in this case the steeple of a single church, remaining above the surface of the water. It has long been remarkable, and a powerful symbol for some, that the cross adorning the top of this structure remained proudly above the surface, marking the location of the former city. However, severe droughts and water shortages in Venezuela have resulted in the effective draining of the reservoir, revealing the church once again. Erosion and water damage makes it look ancient and wild, and although the impressive facade and steeple remain, the body of the church has been worn away, resulting in the haunting effect of seeing a church which appears to be whole and beautiful from the front, only to reveal that it is gutted and empty from the side. For years the cross emerging out of the water has been symbolic for the spirit of a town washed away, and now the revealed and hollowed church provides an eerie metaphor for a town that had its citizens removed. Colombia’s only monument erected to mark the end of slavery in the former Republic of New Granada. Highly unusual subterranean stupa and adjacent cave monastery. Nazca pilgrimage site covering 370 acres is a popular stop for archeologists and looters.